WHAT?! Photo of me on nytimes.com? And not because I committed a crime?! A few weeks ago, I saw a survey looking for thoughts on changing your name when you married. I completed it, and my answers were excerpted in the New York Times last week. I wrote a lot more than was published. I wrote a whole thing about how when we decided to get married, it was a personal, private decision – this romantic loving gesture “let’s commit to each other” – and that it hadn’t even occurred to me to take his name. That maybe I would have felt differently if we’d been together a long time before we married, or if we were younger when we met, etc. I wrote that people have told me I might change my mind when we have children, that I might want to have the same name as my kids, but I think that’s unlikely. I mentioned that I’d asked Z if he would take my name, and that he’d said “no”, he wanted to keep his, even though if he took my name, I think he’d sound like a superhero. 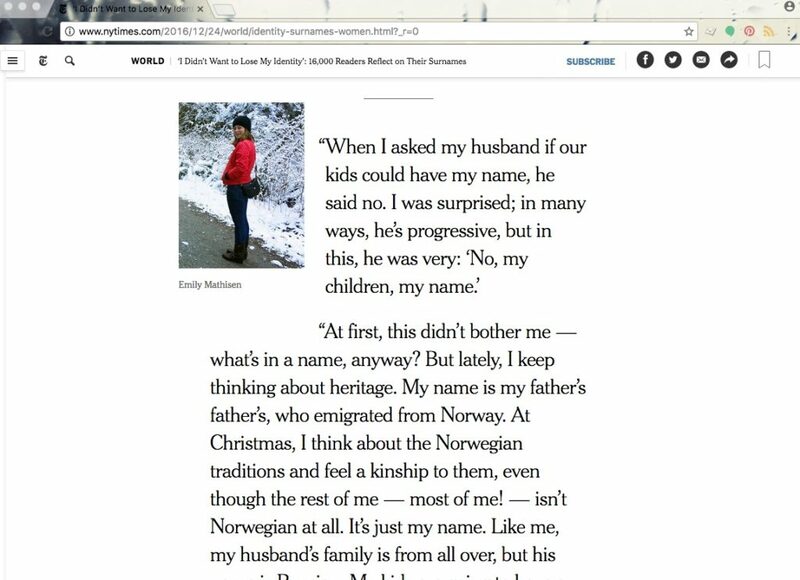 The part they published is the last part of what I said: how I feel about my kids having Z’s name. It’s the most radical part of what I wrote. Z would prefer that our children have his name, not my name, which is pretty common – statistically, very few children take their mother’s name. Anyway, that’s the context. They took the juiciest feminist parts, which is what I would have done too. 🙂 (Z very sweetly said those were his favourite of my parts). As you can imagine, it was very exciting for me to have my thoughts on this published in the Times – I was so flattered to be included!